National artist Chalermchai Kositpipat urged Thai people not to hate or despise Chinese tourists in general simply because some of them have misbehaved, lack manners or cause troubles to people in this country. However, he admitted that previously had negative attitude towards Chinese tourists and was among the first group of Thai people who openly reprimanded them because of their misbehaviours. But, now, after having come into direct contact with quite a few Chinese tourists, Chinese government officials and tour guides, he found out that the Chinese government had tried its utmost to educate its people not to cause troubles in countries where they are visiting. Mr Chalermchai said that his temple in Chiang Rai, the famous Wat Rong Khun, had played a role in changing the behavior of many Chinese visiting Thailand. “They behave better today. They respect the places they visit because they were educated by their government and our temple,” said the national artist who however admitted that there are some Chinese tourists who are yet to change their behavior. 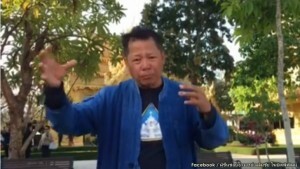 He said he didn’t understand why many Thais didn’t like the Chinese tourists merely because a minority of them caused troubles. “The Chinese are our guests. Our economy is in bad shape, so do not reprimand or hate them too much. We should teach them how to behave and do the right thing for our own benefits,” he added. “I flushed their excretes and I repaired what they broke but I told them not to do it again. I hired more people to look after them and there were now less breakings and no excretes. And this is what we should do and not to reprimand them because they are our guests,” said Mr Chalermchai.